Today I want to discuss an area of pitching mechanics that’s often misunderstood, and that’s the importance of good glove-arm action. I think it’s safe to say, any pitching coach who has a clue about mechanics knows it’s important to stay closed and not fly open with your front side. My college pitching coach used to love telling one of my teammates that he was “swinging like a rusty gate!” Despite the wide agreement on this topic, there’s been a growing debate in recent years around what exactly constitutes good glove-arm action in your pitching delivery. For years, coaches taught young pitchers to tuck their gloves and pull back with their lead elbows as they threw to get better trunk rotation and velocity. Then not too long ago, the idea came along that you don’t actually want to pull back with your glove arm, but you should instead keep your glove out in front of you and just bring your chest to your glove, the idea being to get better extension with your release while maintaining good posture. And so the debate ensued. Take a look at Chapman here. Is he bringing his chest to his glove, or is he actively bringing his glove elbow down into his ribs/hip area at ball release? 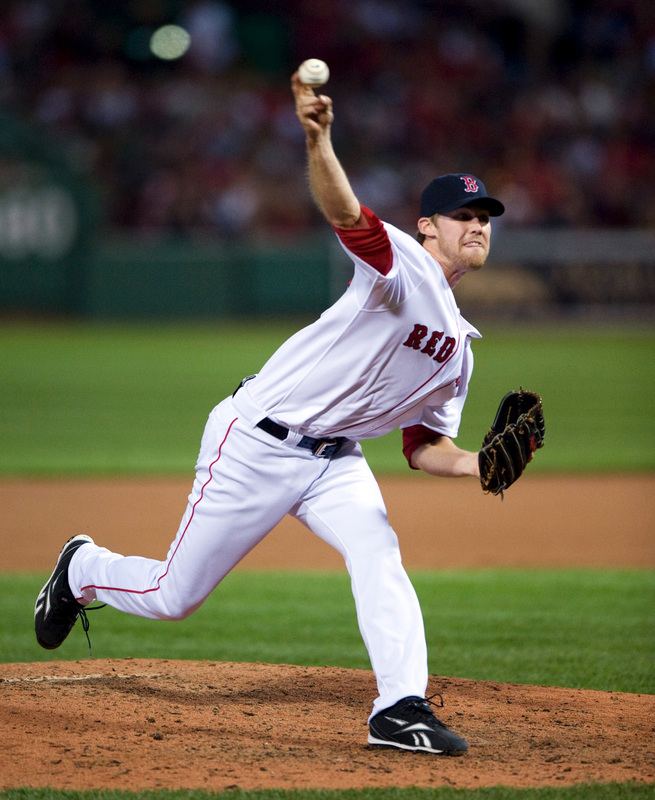 Before we get too deep into the topic, we should establish some basic principles about good pitching mechanics. 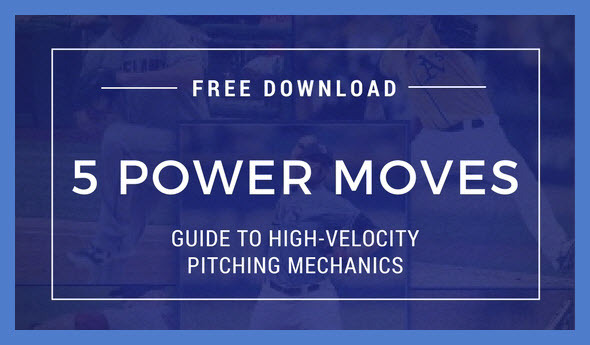 In simple terms, the first phase of the pitching delivery is all about creating momentum and driving powerfully towards home plate. 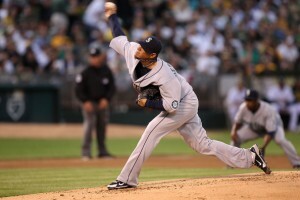 The next step is transferring that force from your lower half to your upper half at front foot plant. This means bracing up well with your front side. This effectively creates a pivot that your trunk will rotate around. If you don’t firm up well and form a good pivot, you end up with an energy leak and lose some of that power, resulting in lower velocity. Most of this involves bracing up with your landing leg, but your glove arm also plays an important role. If you don’t control your glove, but instead swing it out (towards 1st base for a righty) or let your glove drop as your throw, you will open early and lose the rotational power needed for maximum arm speed. Ouch! Don’t drop your glove! This is when you’ll hear coaches say you’re “flying open.” Not only is flying open an energy leak, it’s also a major timing disruptor, which hurts control. If you consistently fly open with that glove arm, your throwing arm will drag, putting more stress on your shoulder and causing you to miss high to your arm side with your pitches. I remember first learning about the idea of bringing your chest to your glove. 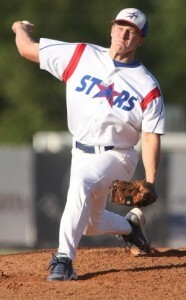 I had just finished my third year of pro ball, and I thought I had a pretty good handle on pitching mechanics. But here was something new. On the one hand, when I was actually shown pictures of big league pitching deliveries, it seemed to make sense. At ball release, all of these guys had their chests out with their gloves right their in front of their chests. It also made sense that pulling the glove arm back could disrupt a pitcher’s balance and limit his extension at ball release. I was a new pitching coach at the time and it seemed like these guys were really onto something, so I began using this cue with my young pitchers. It wasn’t long, though, before I began to encounter a major problem. You see, it’s not that the idea itself is completely flawed, the mechanical theory behind it is actually pretty solid. You do want to maintain good balance in your delivery, and releasing the ball closer to home plate is certainly a good thing. The problem I was noticing had to do more with the way this cue was being processed by my pitchers. I started actually seeing these guys opening early with their front side, getting very rigid with their glove arm, and cutting off their follow-through. This is why today I’m not a big fan of “bring your chest to your glove,” because I feel like it places the emphasis on the wrong thing. You really want to be getting good trunk rotation in your delivery. By focusing so much on getting your glove out and bringing your chest forward, you tend to block yourself off, losing a lot of that trunk rotation that’s so critical for maximizing velocity and decelerating your arm with a good follow-through. And it’s funny because the same guys who first established this teaching cue, also did some great work on a study that determined that as much as 80% of pitching velocity comes from rotational forces. So they know and understand the importance of good trunk rotation as well as anybody, and this is why I feel the concept of bringing your chest to your glove is more misunderstood than it is flat out wrong. The problem is coaches get a hold of a catchy teaching cue like that and run wild, hammering it home like it’s the only thing that matters. Today, when a pitcher comes to work with me for the first time, I can tell after two or three throws if he’s been taught by a coach using this cue. No trunk rotation, no follow-through, stiff. Now the old school idea of pulling back with your glove arm isn’t exactly right either. That’s where the “bring your chest to your glove” guys were onto something. Being too aggressive with that glove arm and actively pulling back can easily lead to flying open or pulling yourself off balance, which as discussed earlier is a major velocity killer and timing disruptor. Opening early also leads to added stress on the arm and greater inconsistency, making it tougher to get to a good release point. So having experience with both the old school approach and the newer “bring your chest to your glove” theory, I’ve come to the conclusion that good glove-arm action lies somewhere in between. 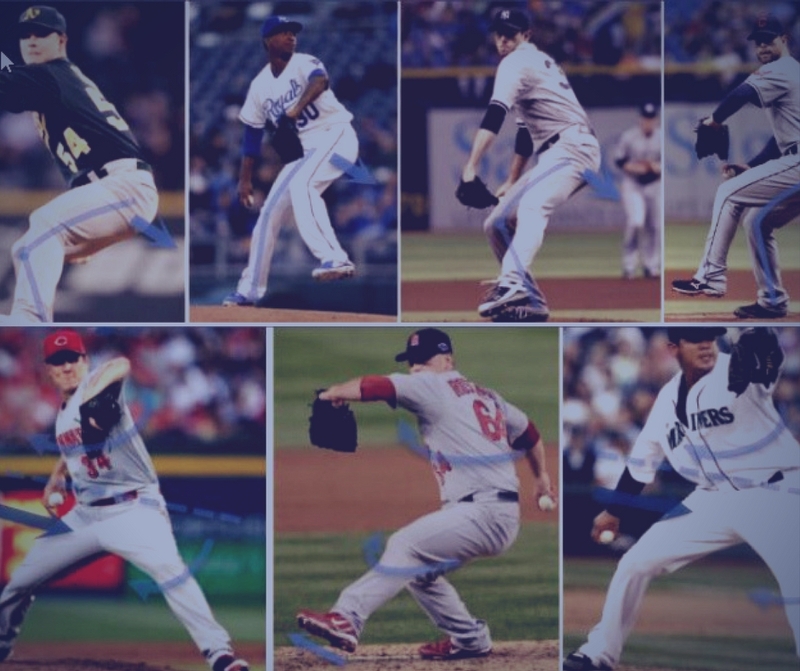 You absolutely want to maximize rotational force in your delivery, but there’s also no denying the benefits and importance of bracing up well with your front side. That’s why today I’ve come to prefer the cue “control your glove.” The idea is you want to be athletic and active with that glove arm (not stiff), but control your glove and bring that lead elbow right down to your side as you rotate and throw. In my work with pitchers, I’ve found “control your glove” to be the most effective glove-arm cue, since it puts the emphasis on bracing up with the front side and creating a good pivot for full trunk rotation and follow-through.